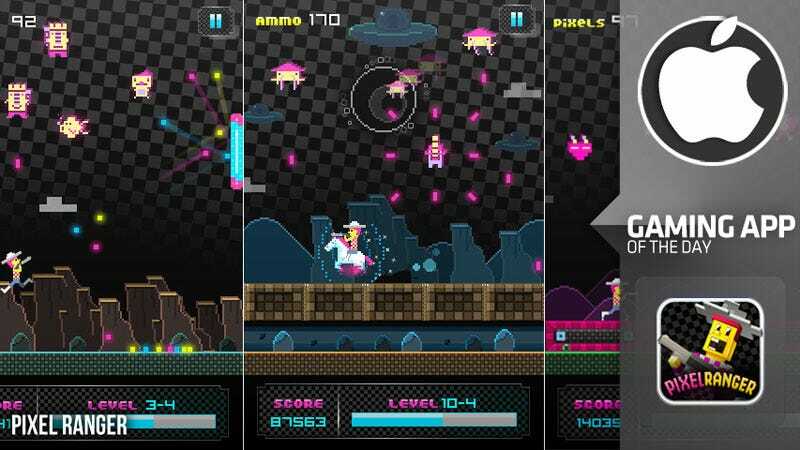 Pixel Ranger for iPhone and iPad feels as deep, engaging and modern as most Atari 2600 games, a CMYK-colored blend of Pitfall! meets Galaga, light on substance, heavy on visual charm. Conceptually, Pixel Ranger is simple to the point of bordering on dumb. Pixelated aliens swarm from above, bothersome lifeforms (snails, turtles, etc.) lurk below. An 8-bit cowboy good with a pixel shotgun must rid each level of both while trying not to die. Pixel Ranger is the latest from Chillingo, iOS mega-publisher of games as varied as Cut The Rope, Anomaly Warzone Earth and Contre Jour. It is also an iOS port of a ye olde Facebook game, should you be wary of spending a cool 99 cents on a new iPhone app. What makes Pixel Ranger perhaps more interesting is its use of the ammunition/life force that is its multi-colored pixels. The cowboy can fire his blocky scattergun at foes, using pixels as ammunition. He'll then scoop up the fallen bits from enemies for additional shots, all the while keeping an eye on his pixel count which also determines his health meter. Pixels are weapon and life in Pixel Ranger, potentially an intriguing system if the game's levels were longer or required more thoughtful play. Instead, Pixel Ranger is straightforward. Fend off the swam a few seconds at a time, jump over underground threats and hope for power-ups. These come in the form of screen-clearing bombs, time-stopping clocks and an empowering steed, among others They'll add a small helping of variety, as will the stages with conveyor belts, ricocheting walls and the occasional boss fight. If I sound under-enthused about Pixel Ranger, that's probably accurate. It's a fun little diversion, full of retro arcade action and a slick coat of paint, but it's perhaps too shallow to recommend. One of its greater challenges comes from the skill required to tap targets on the top portion of the screen, jump with the lower portion and tilt left and right to move the cowboy back and forth. There's some head patting and belly rubbing dexterity required, but no challenge big enough that perseverance and repetitive play won't conquer. Pixel Ranger from Metrogames and Chillingo is available on iTunes for 99 cents. You can contact Michael McWhertor, the author of this post, at mike@kotaku.com. You can also find him on Twitter, Facebook, and lurking around our #tips page.